The Safe Company – Specialist Safe Engineers operating throughout the UK. 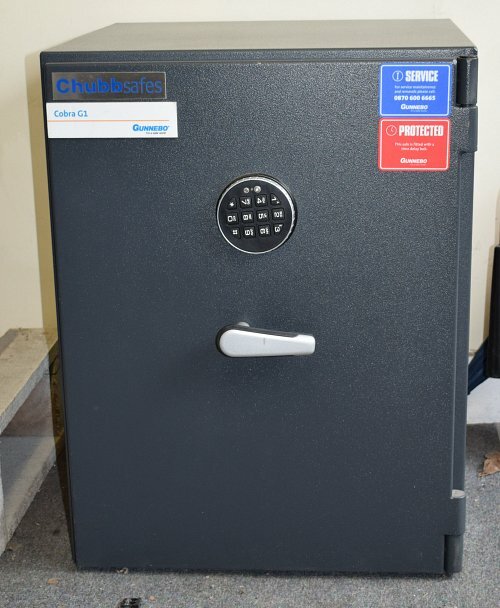 A modern Chubb safe fitted with a high security digital lock for your ease of use. The safe is perfect for both home or business use, and can be bolted to the floor from the inside to keep it from being "borrowed". The safe measures 570x410x340mm internally. The new equivalent today is now £1165.00 plus vat for essentially the same safe. A solid and reliable mechanism, with not much to go wrong. We can send the safe to you on a pallet for around £75.00 plus vat (£90.00 total) for kerbside delivery, or you can pick it up from us in Blackburn, Lancs. We can also quote you to deliver and install the safe if you wish.